The Supermarine Jetfire was a stopgap solution in order to introduce a jet-powered interceptor agains German V-1 missiles that threatened the London region from June 1944 on. At that time, the only aircraft with the low-altitude speed to be effective against it was the Hawker Tempest, but fewer than 30 Tempests were available. They were assigned to No. 150 Wing RAF, and early attempts to intercept and destroy V-1s often failed. One alternative was the jet-powered Gloster Meteor, which still was development - and in order to get the new engine into service (also as a response to Gloster's engagement for E.1/44 with the single-engine "Ace" fighter) Supermarine responded with the idea to replace the nose-mounted piston engine with a single Whittle W.2 engine: The "Jetfire" was born. The conversion was rather simple: the Jetfire was actually a Griffon-powered Spitfire XIV with as few changes to the original airframe in order to accept the W.2. The aircraft's forward fuselage was widened to accommodate the bulbous engine with a simple nose intake. The deeper forward part of the fuselage with its round diameter gave the aircraft a pronounced "pod-and-boom" configuration. Internally, the front wing spar had to be bent into an inverted U-shape to clear the engine and its jet pipe. The W.2 was mounted slightly angled downwards, and the jet pipe was bifurcated so that it ran along the fuselage flanks above the wings, with an exhaust just behind the wings’ trailing edges. To protect the fuselage, steel heatshield were added to the flanks. Furthermore, the former radiator fairings for the Griffon and the respective plumbing were removed and faired over, saving weight and internal space – and weight was reduced as much as possible to achieve a decent performance with the rather experimental centrifugal jet engine. 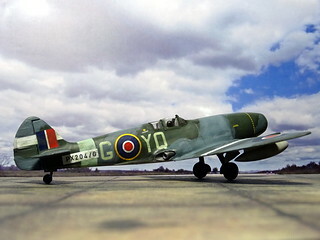 The conventional Spitfire tailsitter landing gear remained unmodified, just additional covers for the main wheels were added for improved aerodynamics at high speed. The first prototype was already finished in October 1944, and taxiing trials started immediately. The heatshields proved to be too short and the heat from the engine exhaust melted the duralumin skin of the rear fuselage. Additionally, the tailwheel received a longer strut for a cleaner airflow under the stabilizer on the ground – the original, shorter strut created an air cushion under the stabilizer that lifted the whole tail upwards when the throttle was opened, resulting in poor handling at low taxiing speeds. Modifications to rectify the problems took until late December, and by this time a second prototype had been completed. After a few taxiing tests, it was transferred to the Royal Aircraft Establishment (RAE) for full-scale wind tunnel testing that lasted until February 1945. On the 26th of that month, the RAF issued requirements that the aircraft should have a maximum speed of 770 km/h (480 mph) at sea level and a speed of 850 km/h (530 mph) at an altitude of 5,000 meters (16,400 ft). It should be able to climb to that altitude in 4 1/2 minutes or less and it should have a range of 500 kilometers (310 mi) at 90% of maximum speed. The Jetfire failed to meet these targets, but it was still fast enough to intercept the V-1 and was quickly available. The average speed of V-1s was 550 km/h (340 mph) and their average altitude was 1,000 m (3,300 ft) to 1,200 m (3,900 ft). Fighter aircraft required excellent low altitude performance to intercept them and enough firepower to ensure that they were destroyed in the air rather than crashing to earth and detonating. Most aircraft were too slow to catch a V-1 unless they had a height advantage, allowing them to gain speed by diving on their target. Originally a total of 200 Jetfire Mk.Is were ordered, and on the drawing board an improved variant with a bubble canopy, a slightly larger tail fin, stabilizers with a 10° dihedral in order to get them better out of the jet efflux’s path and an armament of four 20 mm cannon (the Mk.II) was already taking shape. But this initial and any follow-on orders were quickly cancelled or changed to the more advanced and promising twin-engined Gloster Meteor that finally became operational. Consequently, the total production run of the Jetfire Mk.I just reached 26 aircraft: 18 were delivered to RAF 616 Squadron, the rest were used by the Tactical Flight at Farnborough that had been established in 1944 in order to prepare active squadrons for the radically new jet fighters. In late March 1945, the Jetfires became operational, upon which both tactical applications and limitations were extensively explored. Despite many shortcomings (sluggish acceleration, poor climb and agility except for a very good roll rate), the still rather experimental and primitive Jetfire was able to fulfill its intended V-1 interception role, and two V-1 interceptions were achieved during the following weeks. In the front line units they were quickly replaced by more effective types like the Gloster Meteor, the Hawker Tempest or the Republic P-47 Thunderbolt. Anyway, the Jetfire was still helpful to path the RAF’s way for operational jet fighters and helped discover new high speed problems, including compressibility buffeting at higher speeds, causing increased drag, and it showed clearly the limits of traditional fighter aircraft designs. The first entry for the "Old Kit" group build at whatifmodelers.com in late 2016 - anything goes, the kit's mould just has to date back to 1985 and further. For this one I settled on the FROG Spitfire Mk. XIV, which, AFAIK, dates back to 1969, and an engine donor from a KP Yak-23, which is supposed to have hit the markets behind the Iron Curtain in 1981. Originally, the background story pretty much sums up the idea behind this kitbash: How could the - already fast - Spitfire be further augmented with one of the new jet engines around 1944, when V1 attacks started against the British main land and the Meteor was still in development? A simple engine swap with as much airframe of the piston-engine ancestor would be the answer. Similar ideas had been undertaken in Germany, with re-engined versions of the Bf 109 and the Fw 190, and after WWII, when German jet technology had become available to the Soviet Union, the Yak-15/17/23 family followed a similar pattern. The Yak-23 came as a natural donation aircraft for the Derwent nose. After careful measures and strategic cuts the Spitfire lost its Griffon engine (already earmarked for another kitbash...) and the Yak-23 its nose and exhaust pipe: the original plan had been to use a central, ventral exhaust pipe under the cockpit, even though this would create issues with the tail wheel (just as on the Yak-15 - it received in service an all-metal tail wheel! Imagine the sparks on the runway...). Anyway, while dry-fitting the parts it turned out that pretty little of the Yak-23 exhaust section could be mounted with clean lines: I'd either have had to create a semi-recessed exhaust with lots of body work (and pretty implausible), or switch to a totally different solution. That came with a bifurcated exhaust pipe, running along the wing roots and ending at the wings' trailing edge. While this sounds weird, too, the Hawker SeaHawk actually had such an arrangement - on a service aircraft! As a side effect, the fairings for the jet pipes now offered a good basis for the necessary intersection between the round and bulky Derwent nose fairing and the narrow, oval Spitfire fuselage. The new jet pipes were created with styrene tubes and lots of putty, and the result does not look bad at all. Actually, with the deleted radiators and the Griffon carburetor intake gone, the aircraft has a very sleek profile, even though the top view reveals the innate "pod and boom" layout of the nose-mounted centrifugal jet engine. The latter received a new intake interior with some fine mesh and a central bullet fairing (the Yak-23's vertical splitter would not make any sense, since there'd be no nose wheel anymore). The landing gear was taken more or less OOB, I just added some struts and extra wheel covers. The tail wheel comes from an Airfix Hawker Hurricane and changed into a fully retractable arrangement. The cockpit was taken OOB, too, just a tank dummy was added behind the pilot's seat and the canopy sliced into three pieces for an optional open display. The "E wing" armament was taken over from the Spitfire Mk. XIV, I just added the elegant drop/slipper tanks from the Yak-23 kit. This breaks up the clean lines of the "Jetfire", but I think that the thirsty Derwent might have needed some extra fuel for a decent approach range and some loiter time while intercepting incoming V-1s? The V-1 from the FROG kit was built for the flight scenes, too. It’s a very simple model consisting only of four parts with rather mediocre fir, esp. the pulse engine halves, but a fairly good representation. Maybe the propeller for the fuse timer is missing, but that can be scratched easily. Only personal additions are a grate in the air intake, and a hidden adapter for a display, for the pics. Maybe this flying bomb ends up later as ordnance under a German bomber build? Very conservative, late war RAF Dark Green/Ocean Grey/Medium Sea Grey with typical ID markings and codes. 616 Squadron was chosen because it was one of the units that introduced the Meteor for V-1 interception. Paints are basically enamels from the ModelMaster Authentic range. The Sky fuselage band was improvised with a decal from a vintage Matchbox Brewster Buffalo (matching the the Sky code letters from Xtradecal pretty well), while the codes and serial numbers themselves were created from single letter digits (the "/G" addition to the serial number signaled that the aircraft was to be guarded at any time while on the ground). The cockpit interior was painted in very dark grey while the landing gear became aluminum. As a highlight, the air intake edge was painted with silver, more for a dramatic effect than for realism. The yellow wing leading edge markings were created with generic decal sheet material. The only special markings on the aircraft are the white stripes on tail and wings, which I also used to underlay the serial code. Only little panel-shading and weathering was done, some panel lines were manually created with a fine pencil since a lot of surface details on the fuselage were lost during the extensive PSR process around the wing/jet pipes area. Finally, the kit was sealed with matt acrylic varnish. The V-1 has painted with no special paradigm in mind, with RLM81 upper surfaces and RLM 76 undersides, with a very wavy waterline and some grey patches on the wings. The engine was painted with aluminum first and then a thin coat of red primer added. The resulting aircraft of this kitbash looks better than expected, even though the change of the exhaust arrangement came unexpected – even though I think the Jetfire became more appealing through the side pipes, despite the overall tadpole proportions. As a side note, the story is not over yet, because there’s an engine-less Yak-23 left over, and I wonder what it might look like with a piston engine grafted to the empty nose?